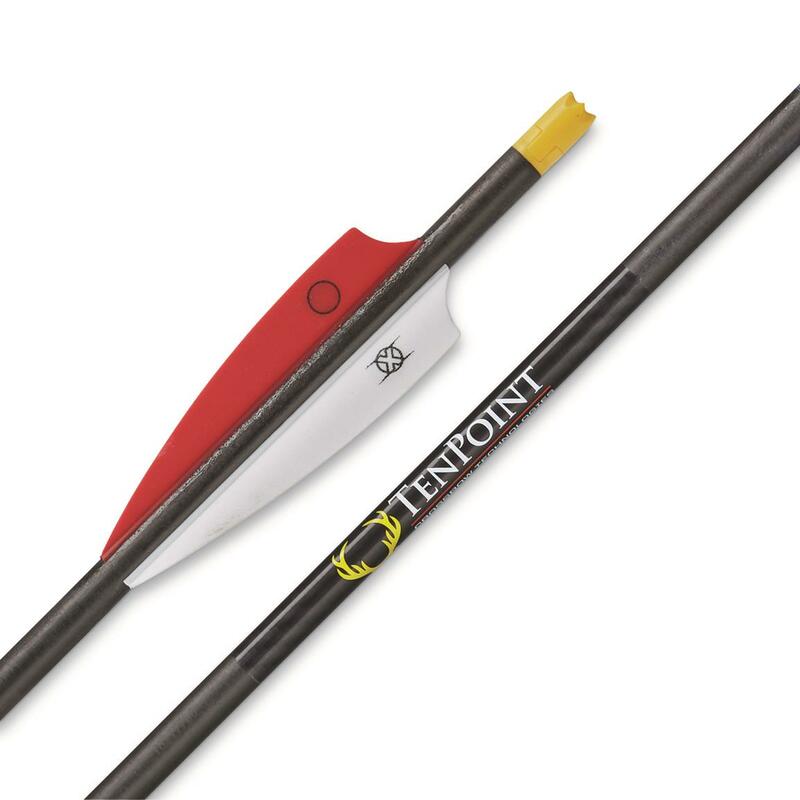 Each TenPoint® Pro Elite Carbon Crossbow Arrow is fletched slightly offset and includes a 68-grain brass insert, SuperBrite Omni-Nock with Receiver, and 3.5" Bohning X VanesTM. TenPoint® Pro Elite shafts are inspected for straightness to within .003" and hand-sorted for weight tolerance. TenPoint Pro Elite Carbon Crossbow Arrows, 3 Pack is rated 4.8 out of 5 by 109. Rated 5 out of 5 by ODell Outdoors from Straight Shooters The Omni-Nock system is great in the dark of early morning when you don’t want to turn on a flashlight to make sure the arrow is in correct. Rated 5 out of 5 by MichaelJ from Fly straight I've been using pro elite bolts for since I first started shooting my first Tenpoint which was a Titan HLX. I've killed numerous deer and shot these bolts hundreds of times in practice. I've damaged very few fletching's and had a couple of broken shafts from deer. These bolts fly true and straight with my longest shot being approximately 35 yards. Rated 4 out of 5 by 18BTL from Pro elite arrows Arrows were accurate and yielded a 45 yard harvest of an antlerless deer from a wicked ridge G3. Rated 5 out of 5 by Akyhunter from Very good arrows I am new to crossbow hunting, have been hunting with compound bows for 30+ years but have health issues and unable to draw a bow. After trying several different arrows I have to say the pro elite carbon is the best arrow I've found. Very accurate and dependable straight out of the box, and I have been very surprised by how durable they are. Wow! These babies are tough, have shot many different targets, plus killed deer, coyotes, and small game and have not had one fail yet. Top notch product, highly recommend. Rated 5 out of 5 by greg11 from Pro Elite Arrows I have used these arrows in both a Ten point and Horton cross bows and have found them to be extremely accurate as well as durable. I have killed three deer with the same arrow. Over the years, I have tried numerous arrows and have found these to be the most accurate and reliable of any that I have shot. I won't use anything else.